A wide range of Purdue student-athletes came out Wednesday to honor Sean Matti. WEST LAFAYETTE, Ind. — The Purdue football team, numerous student-athletes from other varsity sports, athletics department administrators and school officials joined family and friends Wednesday at Saint Thomas Aquinas Catholic Center on campus in remembrance of running back Sean Matti. Head coach Danny Hope, team chaplain Marty Ditmar and teammates Kurt Lichtenberg and Joe Holland were among those who spoke at the service. 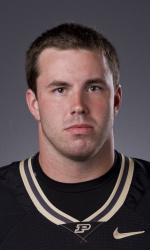 Matti, from Shoreview, Minn., joined the football program in 2007 as a walk-on running back. The 22-year-old (born Sept. 18, 1988) was reported missing Sunday around 11:30 p.m., and his body was recovered in Lake Freeman in Monticello, Ind., on Tuesday. The Boilermakers will hold a moment of silence in Matti’s honor prior to their season opening game against Middle Tennessee State on Sept. 3.